If, like me, you made a New Year’s resolution to start eating healthier, you might be just a little worried about what you’re going to eat at the Big Party coming up this weekend. I’m referring, of course, to the Super Bowl, the day when grown adults run and dodge and knock each other down in their quest to get to the guacamole bowl. Or maybe that’s just at my house. I live with two hard-core football fans who will insist that there be guacamole and tortilla chips to eat during the big game, and if I’m not careful, I’ll start mindlessly snacking all my healthy progress away. That’s why I have a plan–and I suggest you have one, too. You may not be able to keep away from all the tempting snack food, but you can have just as tempting nutritious food on hand to grab when the snacking urge hits. Guacamole itself isn’t unhealthy as long as you don’t overdo it, but packaged tortilla chips are just fried flour and salt. So make your own baked chips, or better yet, scoop up your guac with baby carrots, celery sticks, red pepper slices, cucumber, or cauliflower florets. And be sure to have a filling, nutritious main course that tastes like you’re cheating on your diet (but you’re not). That’s where the chili comes in. Nava Atlas shares this Big Pot of Really Good Chili in her hot new book Vegan Holiday Kitchen (which I had the honor of photographing). 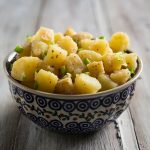 It’s perfect for when you’re feeding a crowd of hearty eaters, and because the seasoning is mild, each of your guests can spice it up according to taste. Vegan Holiday Kitchen contains dozens of recipes for informal get-togethers like Super Bowl parties, so be sure to check out the last chapter on potluck dishes. And if you don’t have it yet, hop over to Hungry Vegan to read a terrific review and enter to win a copy. Nava writes: When you need a heaping helping of something fast, inexpensive, and healthy, few things that fit these criteria better than a big pot of chili. Simple, hearty, and warming, this is a great choice for casual winter parties and for Superbowl Sunday. 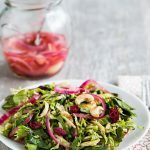 Serve with stone-ground tortilla chips, guacamole, and a big salad or cole slaw. Heat the oil in a large soup pot. Add the onion sauté over medium-low heat until translucent. Add the garlic and sauté until the onion is golden. Add the remaining ingredients except the last three. Bring to a simmer, then cover and simmer gently for 30 minutes, stirring occasionally, until the peppers are tender and the flavors have melded. Season with salt and pepper, and adjust the other seasonings. 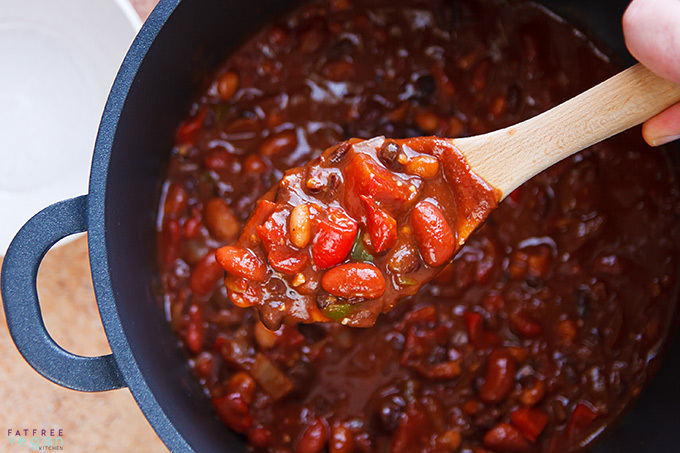 If time allows, let the chili stand for up to several hours before serving. Heat through as needed.The chili should be nice and thick; if it has gotten too thick, stir in a cup of water. Serve in individual bowls, garnished with tomatoes and cilantro. Nutrition (per serving, including oil): 236 calories, 37 calories from fat, 4.3g total fat, 0mg cholesterol, 938mg sodium, 719.6mg potassium, 39.9g carbohydrates, 11.6g fiber, 5.8g sugar, 11.4g protein. Nutrition info below excludes oil. Without oil, one serving is zero points on Weight Watchers Freestyle program. Recipe from Vegan Holiday Kitchen by Nava Atlas. Reprinted with permission. This looks great–there are all kinds of wonderful surprises in that aweseome book! I have been making something very similar to this in smaller batches based on a recipe I saw at Healthy Girl’s Kitchen through an Engine 2 e-mail. I like Nava’s addition of the cocoa powder. I would use carob, but it works similarly. I hope you have a great Super Bowl weekend. I LOVE the blue plate and bowl–just gorgeous! This looks delicious, however, I must ask about the beans- is that measurement correct? It seems like a lot of beans. It’s right–and it is a lot of beans! But the chili is very thick and mostly beans. I actually used 6 15-ounce cans because I didn’t have the larger cans. This chili looks great! I’ll bet it would be really tasty served over a baked potato with some nutritional yeast sprinkled on top. I had leftovers today over a baked sweet potato. Just yummy. I love all your recipes! Thank you for your site! Last year I made it a point to inspire people to have Plant-strong Super Bowl Parties. I even went as far as contacting a bunch of bloggers asking them to post recipes of no-oil vegan super bowl party ideas. My efforts were met with limited success. Wendy, I wish I’d seen your post! Before posting this, I did a Google search for low-fat vegan Super Bowl recipes and found practically nothing. Maybe things are changing, but it’s still tough to find healthy recipes. I make a similar chili with TVP and black beans. I recently took a crockpot of it to a party and while there were other vegetarian chilies in addition to a traditional (meat) chili my pot came home empty and I had several requests for the recipe, most from non vegans. I love all the hearty delicious recipes you post. This year I made a resolution that each week I would cook a new recipe. Thanks to your blog I’ve always got something new and exciting to try! A quick question to anyone who has a “rotation plan” for meal planning. Can you describe that method in a nutshell? Are you in a definite two week plan? a monthly plan? a six week plan? A planned food variety of beans and veggies designed for essential health benefits? A dinner rotation or all three meals a day rotation planning? I am sure I am making this sound difficult but since I am new at this I would like to have some sort of organization about my cooking so it gets easier rather than being so time consuming. Thanks. Just made this recipe for my dinner and it is fantastic! I added textured vegetable protein to it for the meat eaters in my family so it would have the meaty look and feel of carnivore chili. It went down an absolute treat. Thanks! Thank you so much for sharing so many vegan recipes, which is not only good for our health, but also great for our beautiful planet. This looks like a great chili! I’ve never tried adding cocoa powder before…I bet it’s good! Once I started adding cocoa powder to chili, I never went back! It’s such a fantastic “secret” ingredient that adds another layer of richness and depth without a lot of calories. Fan. Made this chili for the family tonight. Enough for an army! Very tasty 🙂 I will use jalapeno next time, went with canned mild green chilis and would have liked a smidge more zing. Will most certainly make this one again. Thanks! Hi Susan – just a quick question for you (apologies if this is covered elsewhere on your site, I’m new!). What are your thoughts on using dried beans instead of canned? I’ve got a pantry full of them for the first time (kidney, butter, and cannellini beans, chickpeas, lentils, split peas etc.) and though I can’t wait to use some, I’m a little intimidated by all the talk of kidney beans being toxic if improperly soaked, drained and rapidly boiled. Have you ever had problems with this? I want to get cracking on a big-pot chili – the Irish winter isn’t cold, but it sure is damp and I need something to warm me up! I think dried beans are always the best option if you have the time; they avoid the BPA problem of canned beans and just plain taste better. 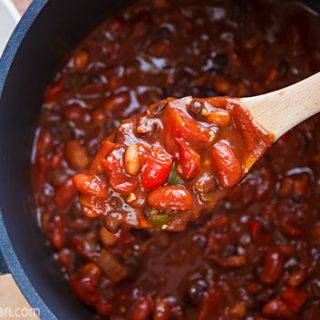 All of your beans will cook faster if you soak them, so starting off with soaked kidney beans shouldn’t be any different. Then make sure they boil for at least 10 minutes. If you cook them in a pressure cooker, that will automatically happen. The only real problem I see is using a slow cooker, which doesn’t get hot enough to boil them. So use a pressure cooker or cook on the stove and you shouldn’t have any problem. I’m delighted with the Vegan Holiday Book. The recipes attributed to Susan are especially inspiring and the photos are lovely. It’s motivating me to stick with vegan version of Weight Watchers – as is FFV. Thanks! I’m from Arizona, where we’re serious about our chili. This recipe is almost exactly what I use to make my chili, except I use a can of tomato paste instead of the sauce. I maintain that the cocoa is the secret to its success. I have also gotten to where I also throw in 8oz of mushrooms and a package of tempeh into the pot to make it heartier (and bigger). Also, a touch of liquid smoke can be an awesome addition. But these things are optional to the base. I have this book and made this chili a couple weeks ago. It is my new favorite chili recipe, and it makes a lot! 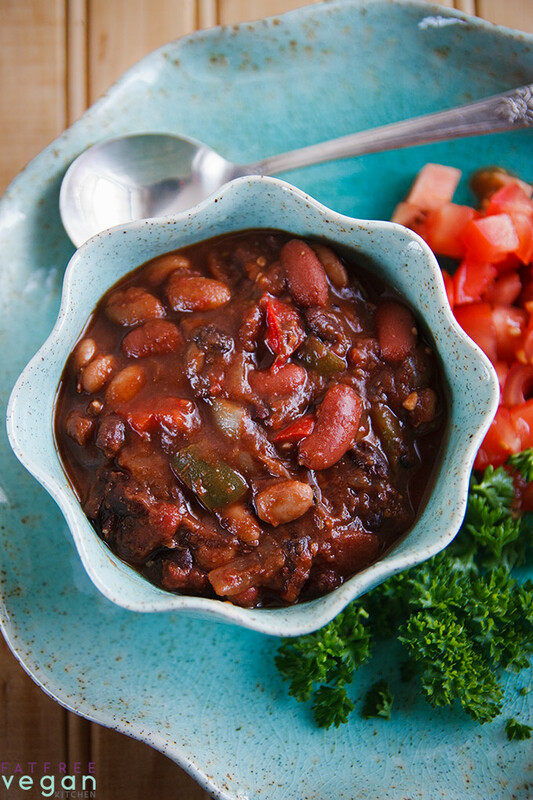 Made this chili yesterday – it was / is excellent on it’s own and when partnered with a grain. I cooked 1 cup of quinoa with 2 cups of water. Put some quinoa is a bowl and spooned the chili over it, topped it with some yogurt cheese. Addicting! This was a hit in my house! Even my stepfather, who never saw a steak he didn’t like, cleaned his bowl (He had no idea how healthy he was eating!). For years, I made a veg chili, but never with cocoa, that secret ingredient that works wonders and which I (inadvertently) doubled, along with the chili powder, but it turned out just fine. Actually, I’ll probably keep it that way in the future, as everyone really did love it. I have a huge bag of pinto beans, and I’m so excited to see this delicious way to use them up! Do you have an idea as to how many cups dried beans would equal 3 28 oz cans of beans? Thanks! I tried this chili yesterday and OMG! It was amazing. I tasted it for seasonings before it was even cooked and kept tasting. It was DELICIOUS! The tomato and cilantro really made the chili pop. I’m a vegetarian at the moment and trying to move on to vegan but with all these amazing recipes you have on here I can see the change coming closer. I also tried the lentil and mushroom shepard’s pie (great! i love wine and mushrooms so I added a lot) and the chocolate chia seed pudding. It reminded me of chocolate cake batter. I loved it! The addition of cocoa powder is brilliant! I would never have thought of it, but it’ll add some amazing earthy complexity. I might cut into the health factor a bit with some non-dairy sour cream, though; the contrast between cool creaminess and hearty heat is too much to pass up! I made it with dried beans (soaked overnight), fresh tomatoes (pealed) and tomato paste (2 table spoons) with long hot peppers (2 of them) . I added some carrots as well (4 small ones) and only one onion. I added only a tea spoon of the cocoa powder and cooked it for ~3.5 hours. It came out AMAZING! Thick with rich taste. Definitely making this one again! I would like to use dried beans instead of canned ones: how do you suggest using? Thank you for all you great recipes!! Susan, thank you so much for this recipe! I made this last week and it was delicious. I think I only used 2 of the small cans of kidney beans. I also made some baked tortilla chips to go with it, so yummy! Perfect for Autumn (here in Australia) :). I think it would be fine in the crockpot. For added flavor, I would go through the first step of sautéing the onion in a skillet and then add it all to the crockpot. Hi Susan, I’ve posted this on your facebook, but also wanted to share it in this recipe since it’s along the same topic. 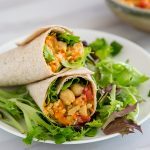 I’ve been following fatfreevegan for a few years now and have cooked up a storm following your recipes! Thank you for all your tips, fine cooking, and lovely photographs. Now myself and a buddy of mine have created a vegan blog and podcast (a foodclass and music selection), do check it out, I would love to hear some feedback. Hope you like 🙂 Have a great weekend. I make it similar, just less beans and more bell pepper and corn in it. The key are the spices and the cacao powder. It even convinces people, who claim they don’t eat veg chili. My vegan family (me, my husband, and our two little boys) visited my meat eating family of origin (my parents, my brother and his family, my aunt and cousins). Everyone LOVED this recipe. My mom is visiting me this weekend and she has placed an order for this! 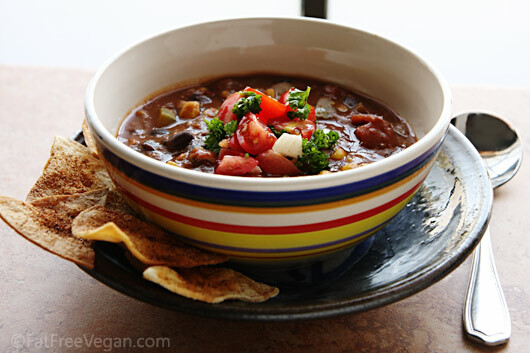 Thank you for this recipe and many others that make my vegan life easier and happier! This recipe is amazing!! I’m recently plant based, and made a “chili” last week that had carrots, chickpeas, and celery. It was good, but it lacked that real chili flavor I was craving. This hit the nail right on the head. Thank you so much for posting! i made it! i also threw in some veggies that was left behind in the corner of my fridge, they taste amazing! thank you for the recipe! its a hit! Just made this for a gathering of about two dozen friends, none of whom are vegan, and half of whom were teenagers. I prepped in my iron skillet before transferring to the crock pot. Doubled the chili powder — used a mix of ancho and chipotle chili powders, added diced sweet potato, corn, and zucchini/summer squash, and four types of beans. It was fabulous. Barely a smiggen was leftover even though pulled pork and grilled chicken were also served (and had plenty left over). Susan, you are a treasure. I so appreciate your generosity in sharing your inspired creations. The recipes here look and sound so good. I can’t wait to make them. I make this recipe all the time and I’m not even vegan. Its just that good! I also have successfully used red wine instead of coco powder. Did you drain your cans of beans? 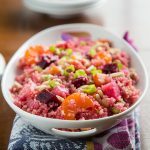 Love this recipe, it is my go to and I always freeze individual portions so that I can have something tasty and healthy when I can’t cook from scratch.